JNN 08 Mar 2014 Karachi : Today we have to decide , for our Generations to come , whether they ll salute us , or will condemn us to a Point , that they ll feel ashamed to show their association with us . As at Present there are two Shariff families at the Helm of affairs of Pakistan , which is at the Most crucial stage of its existence . And this is a Break Point where even a single Minute fault of any will DisIntegrate Pakistan , into such small pieces , that for the coming generations of ours , NO Muslim will ever think of Building there Homeland, A Nation where all the Muslims can Live together in Peace , irrespective of their Cast , Creed , Sect or Ethnicity. The Foremost is the Present Rulers of Pakistan the Shariff family, the Off Springs of Mian Shariff , commonly and generally Known as Nawaz Shariff’s family, as Now he head’s the Clan after the demise of Mian Shariff, the family which has not given any thing to this Pakistan , As per the Record they were a small manufacturer of Iron Products , like Main hole covers , and Bicycle and tricycles for the toddlers , and it was the fortune of these Shariffs that there Cottage Industry was even Nationalized by the Wrong turn of the Century of the Great Bhutto , But as the History gives every body a chance to Recover for his Lost Coins . So the Shariffs even got a chance even and it was the Great Mian Sahib that , When the History took its turn and the Devil was building Its Empire and was choosing his Cabinet , Mian Shariff allowed his Son to be adopted by the The Great Satan in Uniform , which gave him a license to recover his Tiny Tricycle Manufacturing factory , Grown up over the years in a Huge Ittefaq foundary , Which was Build at the Cost of National Ex Checker , and from this Point the whole of the family Never Looked Back , And started to claim every thing of the National Interest , Hard earned By Pakistani , into their Personal Property , upto a Level , where they even Dreamt of owning whole of the Pakistan By Declaring Himself as the Ameer Ul Momineen of Pakistan , But as the God Is Great , and Love & Protect Muslims , So their Nefarious Designs could not be implemented . But As they are Once Again in Power and have attained the Highest Level in the Power Corridor of Pakistan , by the Power & Support of the Devilish Saudi Monarchy , So They still have the Dream of Owning every Pebble and Industry of Pakistan , In the Name of Privatization . While at Present , at the Other side of the Shariff Coin , Is the Present Chief of Army Staff General Raheel Sharif , who belongs to the family , who has already given two Martyrs in the line of Duty , for the Security and Safety of this Nation . While he has been given Birth and Has been brought up By a Noble Mother , who has already given sacrifices of His Elder son , And his Brother who was even Martyred by the enemies of Pakistan , but the Bold and courageous Noble Lady who still have the valor and Courage , and even being a lady , who is Bolder than a Thousand Warriors , still Preaches his Son , to follow the footsteps of His Uncle and Brother and should not deter to lay even his life for the Most Noble cause , that is the Defence of His Homeland , and to eliminate the enemies of the Homeland and its Citizens. Now the One thing Common in both the sides of Coin is that they Both come from the same Nursery , As that the Devil and Prophets Both came to this Earth from Heaven , but the difference is that during the trial Period on this Earth , the Prophets , who has seen the Hardships of this Earth ,will get a Place Back in the Heaven from where they have come from, while the Devils who feel that they have made their Heavens on this Earth and will live for ever , as Preceived By Namrood , Shadad , and Pharohs , will enter Hell and will be justified Here in after . The Problem was not in the Nursery , as it is the same which has created great Heroes like Major Aziz Bhati , Maj Shabbir Shariff, and Numerous others , But it was the Devilish Personnel Character of Zia ul Haq , which not only abused the Power gifted to Him by the All Mighty Allah, but he also used to Make his fortune by trying to Make his Heaven on this Earth , by Earning Money by all the ways and Means , and in his thirst and lust for Power and Wealth , He even abused the Most sacred Religion of the Universe , that is Islam , and he created Mercenaries in the Name of Islam , with a Dream to conquer the World , and as he thought he ll live for ever , But the Justice of the All Mighty Allah is Much More than the Intellect of Created Man. And He finally reached his final Destiny the Hell , while there was not even a Piece of him was found on this Earth for his Burial , But any how some thing was Buried to complete his Last Riots . And His adopted Child , who rose to Power and attained his heights on following the same foot steps , in the same Patterns , and having the same Dreams of Becoming the Ameer ul Momineen of a So called Islamic Emirate . And now We Pray and are Hopeful that the Defender of the Country and the Brave Child of the Noble Lady , who has also come from the same Nursery , but hopefully as per her mother’s wish will follow the foot steps of His Uncle and his Brother , in defending the Country for which he ll not spare any Enemy of Pakistan , and will do Every thing to do every effort to Put the Flag of Pakistan , on Top of the World and can fulfil the dreams of his Elders and martyrs of hIs family . 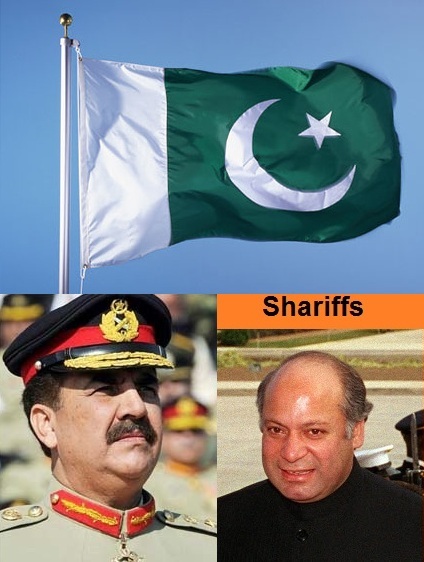 As the Honourable Raheel Sharif who has been granted the Power from the All Mighty Allah and is at the Helm of Power Structure , who has the strength and the support of Whole of the Nation , to back him on his Legitimate actions , in the Elimination of Terrorist and to Safe Guard his Mother Land from the threat of the Mercenaries , which were even created and Nurtured by his Predecessors , on the Request of the Power Hungry Saudi and US Intelligence , Who are Now being directly in command of these Army of Mercenaries , which are now available for them and for every one who is ready to pay them their Booty for Killing and terrorizing the Peaceful . So Now as the Nation is at the Cross Roads , Which are Once again the defining Moments of History , as if the Brave Knight , who has already Challenged the Killers of his Fellow Armed Personnel and the Innocent Citizens of His Motherland , should not even give it a second thought , as the Devilish Shariff is Once again trying to give them a safe Passage , as per the Pressure of his Saudi Masters , But as every body is aware of the fact , that the real Power lies with the Knight , So He should Not be confused by the apologetic tone and style of these Devils , as they will even Not spare him , Once the time has Passed and they have re Grouped and Had Been Re Vitalized , which at the Moment they are afraid off. The Plan should be chalked out on War footing , for safe Guard of Whole of the Pakistan , as these Devils , have been holed up in every Nook and corner of Pakistan , and the Day their Hideouts are Bombed and Destroyed , their Fellow Men will definite , try to create chaos across the country , by stepping up their terrorist Activities across the Country , So an Operation Clean up Across the Country , should be Planned in Advance . While at the same time , National Disaster Management Cell , should also be activated to Make preparations for the Re Placement of the IDP’s , who will be displaced during the Major Operation in the FATA and adjoining areas. And at the same time the Terrorist who are already in Pakistani Prisons, which are More than 8,000 in No. and have even been convicted in their Heinous Crimes By their Most favored Courts, and whose Mercy appeals have even been refused by the President and are waiting the executions, should be executed at the Earliest. As it will Break the Morale of the Terrorist , who think that they are well supported by their Saudi & American Masters and No action can be taken against them , even if they are being captured By the LEAs. As the whole of the west who does not leave any terrorist on their ground and execute them with No mercy , while if any other execute their favorite team of Terrorists ,then the create a Hue and cry in the Name of Humanitarian Causes. The Control of All the Seminaries , which are Known Nurseries and Sanctuaries of these terrorist should taken by the Army Guards with zero Tolerance Action Plan so No Other Major Disaster should Happen as in the case of Lal Masjid Operation , as these Lal Masjid comes under the same Pretext of Masjid e Zarrar , which our Holy Prophet Himself Ordered it to be Demolished. The Present Government which has completely lost its credibility , As now the Known facts at all levels that All the Last Elections were a mere Mockery , and were complete fraudulent , so there is No Justification in Keeping the Present Government Set Up . While as this is also a Proven fact that the Pakistan Army is Best in the Administration , so the Administration of the Country should be Run by them , while for all the other Departments of the State , Loyal and Patriotic Technocrats should be chosen and Be Placed , in their respective Departments , and as the Previous President Pervaiz Musharaff who is a time tested and Certified Patriotic Pakistani , and it has also been Proven that he has Not done any Corruption , while being In absolute Power for about Nine Years , so He Must be consulted on the Main Core Issues of the Government , And if No other Option is available, to head the Government , So He might be given another chance to Put the Economy and the State , right Back on Track . While At the same time a Transparent System should be designed , through which Local Government system , should be re Introduced across Pakistan on Non Party Basis , Including FATA, and Gilgit Baltistan , to develop a Clean and Clear Democratic System , and which should serve as the Hatchery of the New Political Set up & Politicians , in the years to come . While all the Present Politicians , Bureacrats , Civil Servants , Retired and Serving Generals , Judges and other Influntial Persons , who have looted the wealth of Pakistan should be Held accountable and asked to Bring Back and surrender every Penny they have earned through Illegal means , and those who Return and surrender even 75% of the looted National Wealth , should be pardoned , while the Others who do not cooperate , they should be executed and their all the Blood relations and spouses , should be exiled with their Nationalities canceled . As Pakistan is already a Huge Country of More than 180M , and if such cleansing even Cut it short to 160M , then even the rest of the Brave , Patriotic and energetic Pakistani Population is enough to take it to the top of the World. Once the system is cleansed , Pakistan is Located at a Strategic Position where if it does not even take advantage of its Rich Land full of Resources and Hard Working Men and Women , then even it can be Prosperous ,by Just taking advantage of its Location , which is More Important than Any of the Near By Ports including Hong Kong and Singapore . Opening it routes from Karachi and Gwadar to the Central Asian Countries , from South to its North , while at the same time Connecting its Eastern Boundaries to the Western Border , which will result in connecting China to the Europe By Land Route , resultantly making our Nation Prosperous and emerging Nation to be the Leader of the Next Generation. This entry was posted in Asia Pacific, Jafria, Pakistan News and tagged Gen Raheel Sharif, nawaz shariff, pakistan. Bookmark the permalink.